Before you read this post, listen to your favorite fist-pumping workout song. Lately, I’ve been thinking a lot about the psychological willpower of working out. 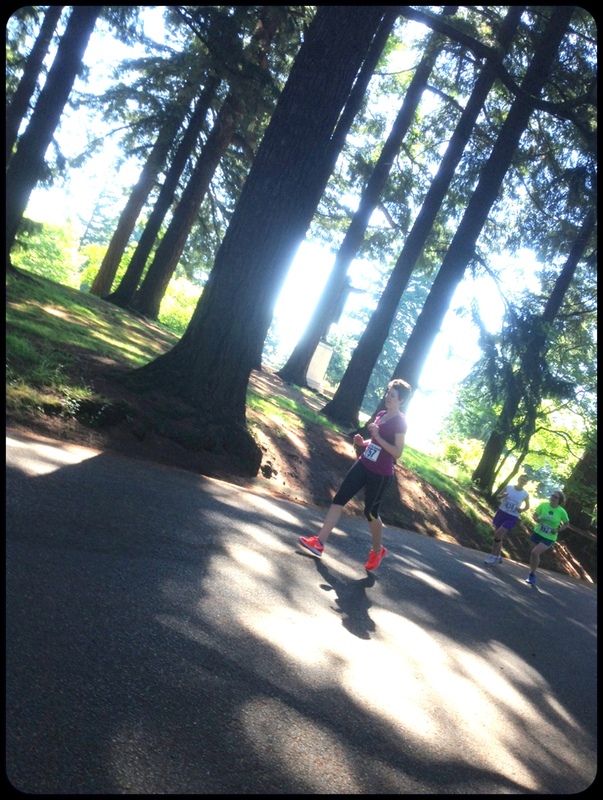 Maybe I’ve been reading too much Runner’s World, or maybe all the people being active in sunny Portland these days have got me thinking. My willpower and motivation have been a little — well, a lot, actually — stagnant for some time now. The hardest decision in the world for me is whether to leave my apartment to go to run club, or to yoga, or for a hike, or to just stay in. And forget doing these activities on my own. I’ve already written about the benefits of community for the active person, and I’m finding myself relying on my community more than ever these days. But day by day, I’ve been choosing being active over being sedentary, even if it’s just a neighborhood walk. Some days, for me, that is a really. big. deal. And I won’t say that every day I’m getting better, but at least every day has opportunity. And in all of my twenty four years of life, I’ve never, ever, regretted moving my body. Even if it was hard. And then I realized: I’ve never not been able to get through a yoga class. For all the times after work when my brain tricks me into skipping class because “I need a rest day” or “it’s too hard right now,” I haven’t been thinking clearly, and remembering all the classes I have made it through. And if I ever — and I have — have to move to child’s pose for a rest, so what? My work out is for me. It’s not for anyone else. The same goes for running, for hiking, for climbing, for lifting, for paddle boarding, for rowing, for cycling, for _______. You fill it in. If you have to stop and walk, do it. If you have to stop and sit, do it. You’ll still put in the miles, and you’ll still be doing something worthwhile. Some of us hold on so tightly to our perfectionism, our competitiveness, and our need to please, that we beat ourselves up for the few backslides we may have in our workouts. But we don’t reward ourselves for the big picture. I hiked 6.8 miles this weekend up to Dog Mountain with some friends, the first four of those miles at a pretty steep incline. I wasn’t first in line; in fact, I was hundreds of feet behind my friends, taking pictures and adopting more of an amble than a fast-paced hiker’s clip. But did I have fun? Did I get to pet a lot of dogs and exchange a friendly “happy hiking” to everyone on the trail? Did I release some of my stress into the abyss instead of holding it in my muscles and joints, all without having to go at a breakneck speed to the top? Did I smile, while out in nature, in the beautiful region of the country in which I live, and realize for one second how lucky I am? Yes, to all of the above. So don’t be afraid to call yourself an athlete. Don’t be afraid to say you are a yogi, not a once-weekly attempter of airplane pose. A runner, not a jogger. A hiker or a climber, not an “I like being outside and taking pictures while simultaneously crawling on alternate terrain” sorta person. Because I have a confession to make: I am the latter of all these labels. But I choose to call myself a yogi, a runner, a climber, a hiker, and whatever else I want to be. For all of us who have been inspired to incorporate more adventures into our days off, or add more activity into your life, or to find the sport that gets your adrenaline going like nothing else, just take a second and recognize how great that is. That idea blossomed in your mind and you held on to it, instead of letting it go. It seems like everywhere I look, I see runners. Women, men, kids (at my last event, I might have been nearly outrun by a child of no more than ten), teenagers, old dudes, groups and independent trotters, all out in the heat and cold, rain and sun. And I’ll say it–there’s nothing like peer pressure to get you out there and running. I usually run on the Willamette River Waterfront Park, which, aside from being flat and open, gives me a stunning view of the bridges in Portland and is simply gorgeous at any time of the day or night. You can run all the way down to the OHSU tram, or cross the Steel Bridge to the east side and run towards Sellwood. But sometimes it’s nice to get out of the sun and reconnect with nature. Since our temperatures have been reaching the 80s recently, being under tree cover is also easier on the eyes and skin (but don’t forget to spend your 15 minutes outside to get some vitamin D!). 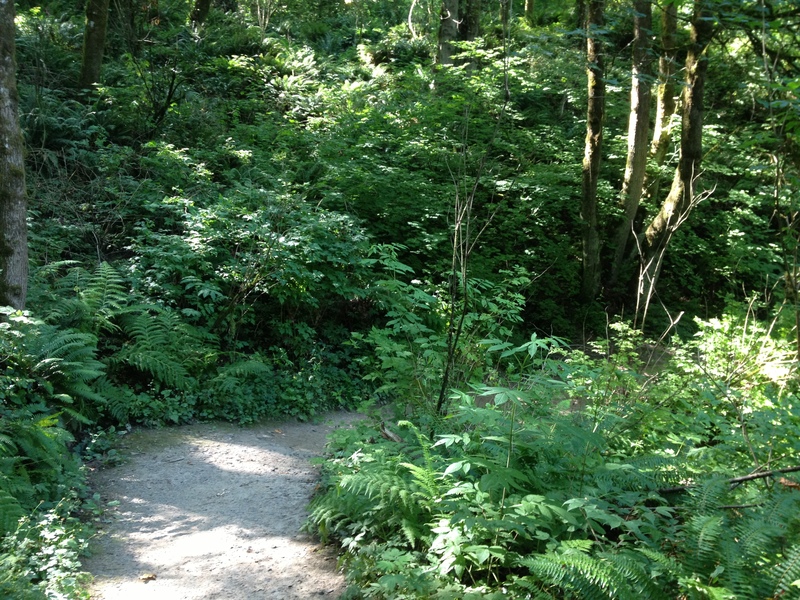 Portland’s extensive Forest Park runs up and down the west side of town. It’s only two miles from where I live, and the trails cover over 70 miles! That’s a lot of running. I hit the Wildwood trail — it’s probably the most popular out of all of them, but at 4 pm on a Friday, I had the park nearly to myself. 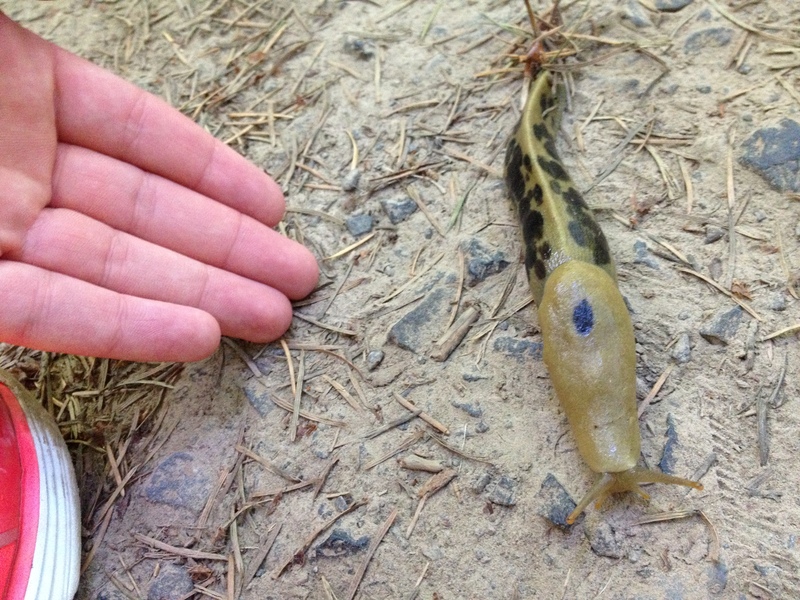 Running in the forest is cool because you might find a slug that is bigger than your hand. I also discovered that I’ve been doing it wrong — instead of maintaining a steady pace, it’s much easier to take advantage of the natural ebbing and flowing of a park trail. Sprinting the downhills and then using that momentum for the inclines was a much more efficient way to run the trail. And it was exhilarating to run that fast without worrying about other people being around. That’s because what I call running is, for me, mostly stumbling around. Nevertheless, I highly encourage you all to check out your local park or forest and try a trail run. Bring water, watch out for rocks and roots, and be prepared for some delayed-onset muscle soreness (trail running works stability muscles that aren’t as necessary on a long, flat course). 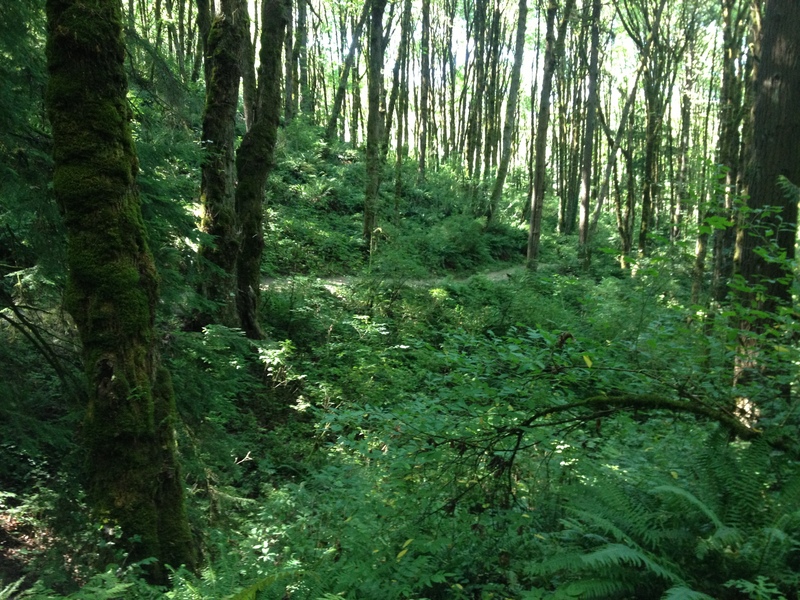 If you live in the Pacific Northwest, trail running will make you feel like you are living in Fern Gully: The Last Rainforest. 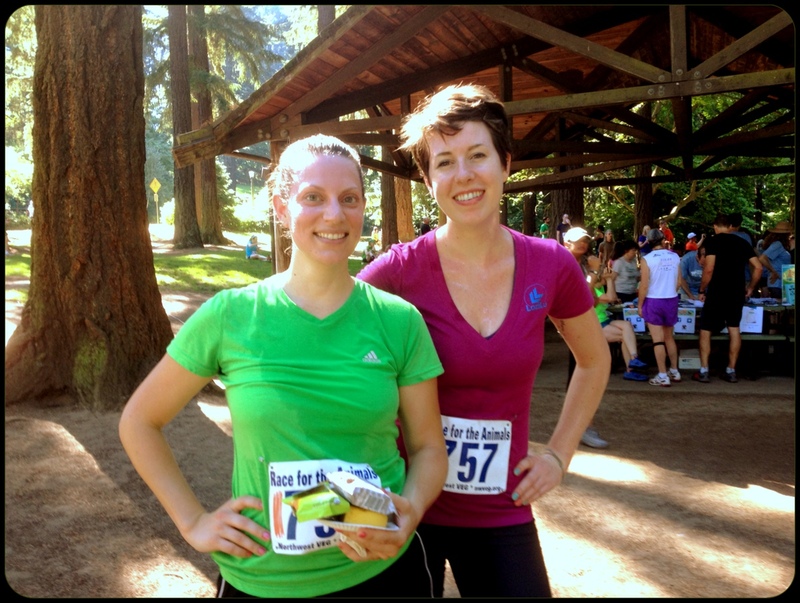 Wait–a 5k a day? Never mind. I’m definitely the wrong author for that post! Northwest Veg is a fantastic vegan community located in Portland. I discovered it last year during the annual VegFest, at which the honorable Ginny Messina, MS RD herself spoke! If you’re vegetarian or vegan-minded like myself, you can score some sweet deals by becoming a member of NWVeg. They offer discounts to local supportive restaurants and businesses and put on some fantastic events. This particular race featured Out to Pasture, an amazing farm animal rescue located in Oregon. As for the race itself…it was hard! 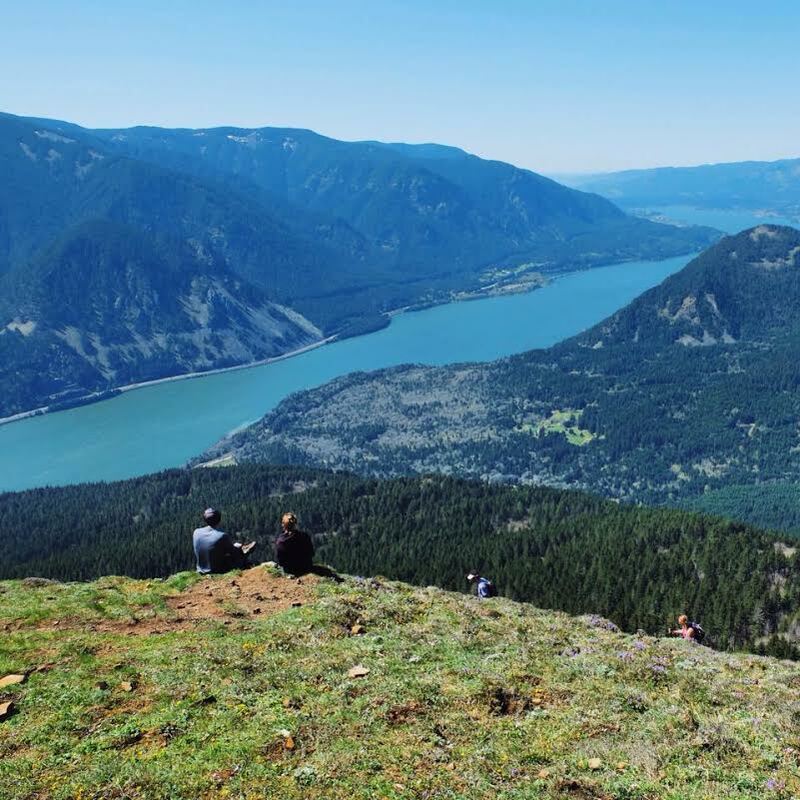 Mount Tabor, an inactive volcano located on Portland’s east side, is just that–a mountain. The first two miles of the race were gradually downhill, and my running buddy and I took off to make up for what we knew would be lost time on the way back. We were probably averaging a 7.5 or 8 min/mile (don’t be fooled–I’m usually much slower). The last mile uphill was rough, but we still finished in under 30 minutes. If you haven’t done an organized race, what are you waiting for? I know it can be scary–I’ve only done three, but for each one I’ve woken up nauseous from fear I won’t be able to finish. But that’s so silly. Even if you ran a minute/walked a minute for the whole race, you’d still finish easily. And what a rush! The energy from the crowd, the countdown from the clock, and the very last stretch of the course…it’s all worth it. Not to mention, races are usually funds for fantastic causes, and benefit both you and the community. Oh, and how could I forget? The swag is awesome! 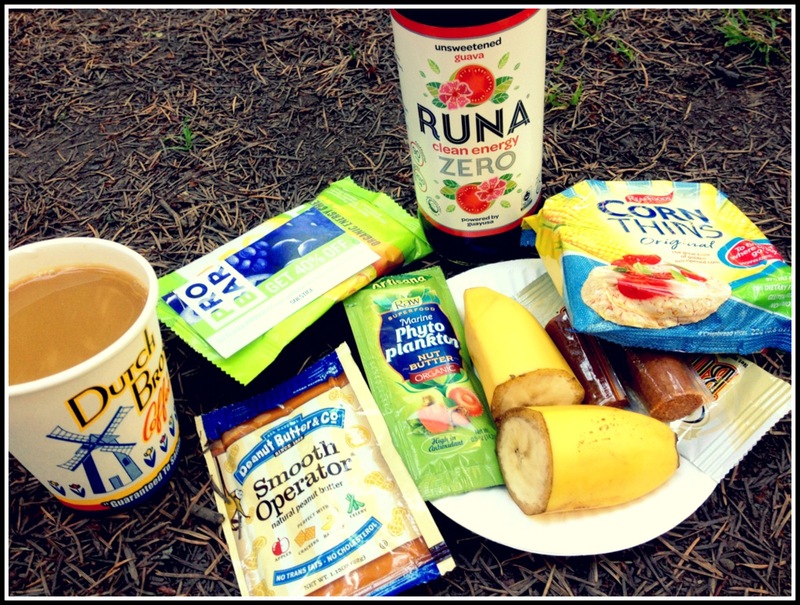 Super tasty snacks…but I really just needed my coffee after that early run. 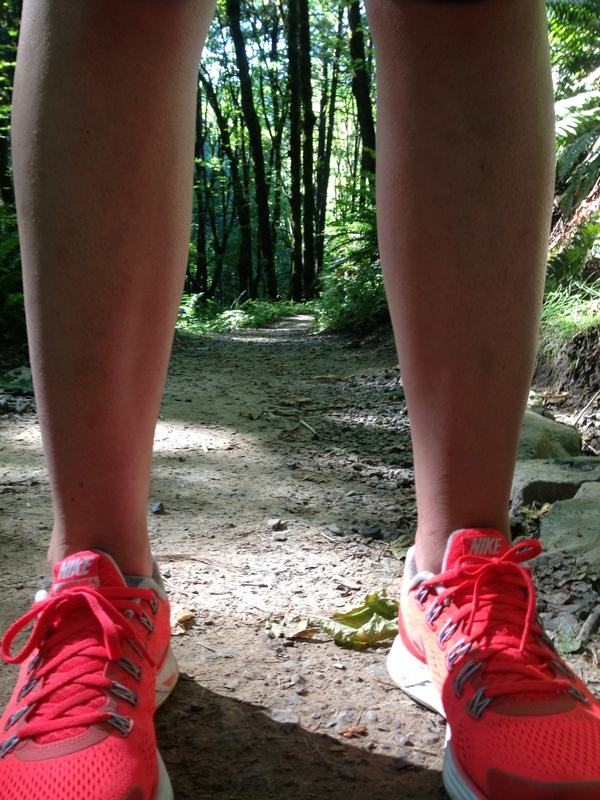 Fact: neon kicks make you run faster. Running always leaves you with a smile. What races are you running soon? Leave a comment and tell me more!